Around July 1st every year we quit weeding. A full-out boycott and strike…we are tired and weary and need a break! We let the weeds take over. To clarify…all along we have been weeding out undesirable weeds by hoe or hand. We LEAVE legumes that are low growing and provide a nice ground cover. We aim for soil protection from heat and moreso, a polycrop environment. I hate Canada thistle…and in areas have fought with them and don’t get them all. It is confirming to see some sort of bugs eating them, chewing holes into them and leaving the garlic alone. Kevin has been applying compost tea weekly. The plants love it~~us not so much. He comes in the house stinking like a rotten fish! 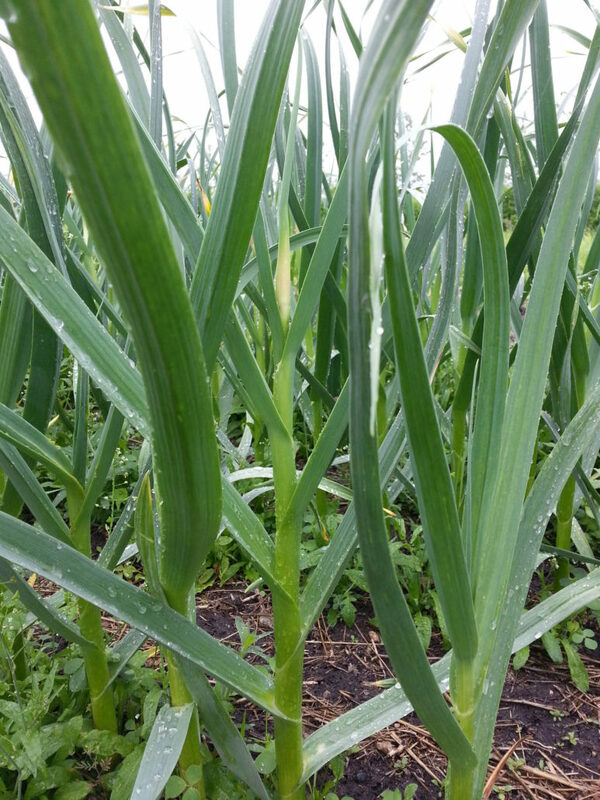 It is nice to see the change in color of the garlic leaves within a day or two. We are noticing a much nicer soil to weed, too. I vividly remember years of cement soil, and trying to wack the weeds out, breaking hoes. The soil is much softer now, and like pulling weeds out of a bag of peat moss. Sweet. I love compost and wish I could create more. Will spend an afternoon driving around town collecting bagged leaves from the townsfolk. Also heard that dog hair is a good activator so have a dog grooming friend saving her clippings. Not sure I could let even beneficial weeds growing in my garden. Am I OCD when it comes to weeds?😖 I’ll have to try the compost tea. Scape Picking Aug 3 ~~Harvest has begun!